Public health care infrastructure continues to crumble as patients struggle to find money to pay for drugs. The waiting room was hot and sticky as more and more patients filled in to the crowded lobby. Agnes Nampewo sat patiently with her young son sleeping on her lap. She arrived early at 7am and was still waiting four hours later. “I woke up early after my son started crying and writhing in bed. I realized he was in pain and was sweating. I got a basin with water, soaked a cloth and wrapped the cloth around him to drop the temperature. This I did till dawn broke and I had to walk to the main road and wait for a taxi to get me to the hospital,” said Nampewo. This mother of three and a resident of Kanyanya had a sick son so she came to the place where she thought someone could help him. She came to Mulago Hospital. Soon after we spoke, Nampewo and her son Andrew are finally taken in to see a doctor. She looks relieved. Her son is diagnosed with malaria. The doctor hands her a prescription and sends her to the pharmacy. But there she is told that there is no more malaria medicine and that she must go to a private pharmacy in Wandegeya in order to purchase some. She is devastated, knowing that she cannot afford the prices charged at the private pharmacies. She walks out of the hospital, carrying her sick child. He is still sleeping. To experience what it feels like to be sick, to walk into any hospital or any other public health centre only to be turned away for lack of drugs is an increasing phenomenon in Uganda. Patients all over the country are being forced to turn to untrained doctors because of the high cost of private health care or the non-existence of public health care. And standing in between these tragic consequences are the doctors, nurses and midwives who have to watch how these circumstances impact their patients every day. But while the public health facilities are in an appalling state, visit any private hospital, you will find a lavish reception area, soft leather sofas, and a water dispenser in one corner plus a nice colour TV screen showing DSTV channels. In one of the private hospitals I visited, I had to wash my hands before entering the reception lobby. And the market for private health facilities is booming as new hospitals sprout up all over Kampala. AAR is building a new hospital in Kololo and the new Nakasero Hospital has been mentioned by experts as the finest facility in the country. This is a great development for the country. More facilities adds value to the country. People are healthier and others are employed. But the money set aside for the public health system has been ignored and looted and as usual it is the poorest and the weakest in society which suffers. Asifa Nakaweesi, 26, a mother of two, apprehensively sits on a bench together with over 70 other mothers waiting to see the doctor. “I have been here since 9:30 in the morning but have not seen the doctor yet.” Having walked a few kilometres to the Kawempe Health Centre, her complaint is not any different from the other mothers whose children are suffering from malaria: diarrhoea and cough. At Kiswa Health Centre near Bugolobi, Mary Chandilu, 22 also experiences similar difficulty after her one year old daughter is diagnosed with malaria. “I have come here twice to get medicine for but I am told that there is none. I have been to a pharmacy and they asked me for 10,000 shillings which I do not have,” explained Chandilu. As a recent report has revealed, national medical stores are empty of the most critical drugs and full of unneeded or expired drugs. This is perpetuated by the repeated accusations that public doctors are conniving to steal public drugs to resell them in their own clinics. These depressing scenes play out on in a country where the Ministry of Finance reduced budget allocation to the sector by five billion shillings compared to the 734 billion in the last financial year. 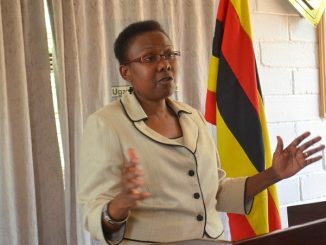 This is 10.3 percent of the national budget and this financial year the Ministry of Health budget request to the Finance Ministry was 750 billion shillings with the aim to improve the state of the public health sector. The budget cut has sparked several reactions from legislators and the public, casting a doubt on the government’s role to provide basic health services to its citizens. 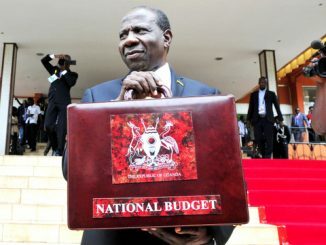 However, according to the current budget allocation, it is becoming hopeless for many Ugandans to go to the public health facilities for diagnosis as many government health facilities are short of essential drugs. The staff morale in the majority of these facilities is decreasing due to poor pay and lack of basic equipment to handle simple cases. According to the Dr. Kenya Mugisha Nathan, the Director of Health Services at the Ministry of Health, despite the reduced budget funding the health sector, there are more problems to in the sector that include increasing population on limited medical facilities. Mulago’s maternity wing was designed to deliver 20 women per day but today they are delivering 100 women per day. Mugisha argues that in 1962 when Uganda got independence there were between six to seven million people that would adequately be served by Mulago National referral hospital. “What do we have today? We have 32 million people all being served by Mulago. We should instead have six national referral hospitals by now,” he said. Mugisha challenges the Members of Parliament to lobby for the construction of more health facilities instead of blaming government. “Much as government has the responsibility of providing affordable health services, the politicians should strive for creation of new facilities through lobbying for funds in Parliament,” he added. There are plans in place to have more referral hospitals built in Kidudu, Kawempe and Naguru while another will be built in Wakiso and Mukono subsequently. But these plans are yet to be realized. It began as most workshops do, waiting after the allotted start time for the guest of honour to arrive. Instead, Minister for Local Government Adolf Mwesige did not show. His assistant appeared in his stay to announce the minister apologized that he could not make it but had to fly his child to Nairobi for medical care. The casual way in which the assistant admitted this fact was at once completely normal and shocking. Even with the increasing number of private hospitals in the capital, ministers and those in public office prefer to seek medical attention abroad. When President Museveni flew his daughter to Spain in the presidential jet to deliver her baby, he defended his actions as those of a concerned father and not a president. A recent report by the Foundation for Human Rights Initiative called “The Right to Health Care in Uganda”, stated that there are 26 districts in the country that do not have a hospital. 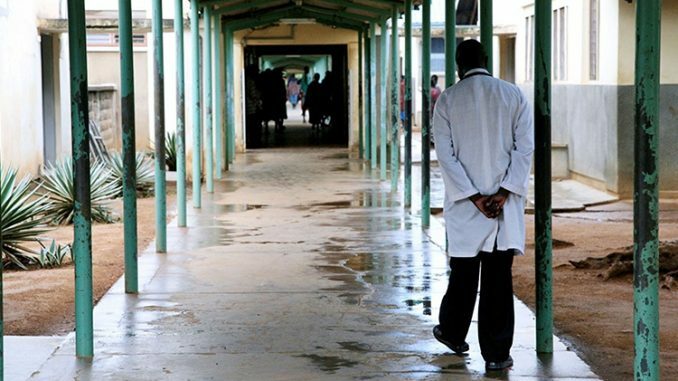 “Although the number of health facilities is increasing in the country annually, on the ground the infrastructure is severely lacking, patient wards and beds are insufficient leading to a compromise in the services offered,” stated the report. Recently, the European Union withheld sh8.5b budget support to Uganda “due to slow progress on key indicators related to the fight against corruption”. “We should stop blaming the donor community for cutting aid to Uganda when we have some political leaders abusing the little that is being provided from abroad. Remember that is tax payer’s money from abroad,” said Dr. Epatait Francis, the opposition Shadow Minister for Health. After numerous trips back to the medical centre, Mary Chandilu never received the necessary drugs for her malaria-stricken daughter from the public pharmacy. “After three days I gave up. Luckily I was able to raise funds from my brother and buy the drugs from the private pharmacy,” said Chandilu.